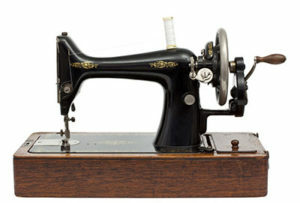 On this date in 1846, Elias Howe, a machinist from Boston, patented the first sewing machine. It took eight years of tinkering for Howe to develop his 250-stitches-per-minute machine, which did the job faster than five speedy hand sewers. Afterwards, he spent nearly a decade trying to garner interest in his machine, and then protecting his patent from copiers, including Isaac Singer. Finally, after much legal wrangling, Howe emerged victorious and began earning substantial royalties. During the Civil War, he served in the Union Army as a private, and donated money for equipment for his infantry regiment.